Multitasking has become a way of life. Most of us think nothing of juggling a couple of chores at once, whether at home or in the office or, most dangerously, on the road. 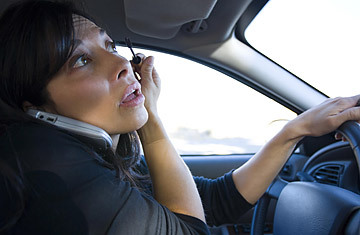 And despite some states' bans on talking while driving, as well as a raft of studies showing the potential deadliness of distracted driving, chances are good that you still have cell-phone conversations behind the wheel. Chances are also good that you think it's O.K. because you're a truly capable multitasker. Maybe you even consider yourself one of the few supertaskers who, unlike the rest of us, are so mentally agile that they can safely talk or text  or pen a novel  while driving. A new University of Utah study on distraction in the driver's seat finds that such virtuosos do exist: the paper, which has been accepted for publication this year in the journal Psychonomic Bulletin & Review, found that a very small percentage of participants  2.5% to be exact  were able to do other things successfully while driving (in the study, it was solving math problems and memorizing words) without a drop in performance on any task. In fact, some of these supertaskers performed better while multitasking than they did while completing the tasks alone. The authors of the study suggest that there may be a set of biological, genetic and perhaps behavioral factors that contribute to efficient multitasking, and that maybe some of these factors can even be learned to make the rest of us better at doing two things at once. Jason Watson and David Strayer, psychologists at the University of Utah, assembled a group of 200 undergraduates and asked them to perform a simulated driving test as well as a standardized memory test that involved math and word memorization. Each of the students first performed these tasks separately, then simultaneously. For the multitasking portion of the experiment, researchers asked the volunteers to complete a verbal version of the memory test on a hands-free cell phone while driving in a simulator. During the hour-and-a-half session, 97.5% of the students showed a significant decrease in their driving abilities and memory skills while multitasking. "What we think is happening for most of us when we multitask is that it's more than what our mental capacity, or mental resources in the frontal cortex, can handle," says Watson. The frontal cortex acts as a master switching station that manages where the brain focuses its immediate attention. "So our performance is going to suffer when we combine different tasks." But a minority of students in Watson and Strayer's study  the other 2.5%  showed no declines in performance, and in some cases even logged an overall improvement in ability when various tasks were combined. This is the small subset of individuals whom the authors call supertaskers, whose brains seem to function differently from those of the rest of us. Supertaskers can juggle simultaneous tasks without experiencing a drop in attention or focus, which flies against the conventional wisdom about how the human brain functions. Experts believe that the brain has a fixed budget of resources, with demands on its attention serving as expenses. Given the limited neuronal budget, the brain can devote only so much of its resources to any particular task; if demanding tasks pile up on each other, then each task is allotted a smaller and smaller amount of resources, which translates into a decrease in performance. See the best travel gadgets of 2009.